… did not cease to teach and proclaim. The apostles were flogged, and they rejoiced. They were ordered not to speak, and they did not cease to teach and proclaim. As we continue reading the next few chapters of Acts, we will see the apostles appointing seven deacons to serve the needs of the Greek-speaking believers as well as the Jewish believers. The song they sing is for “every family, language, people, and nation” — for the whole kingdom of priests. 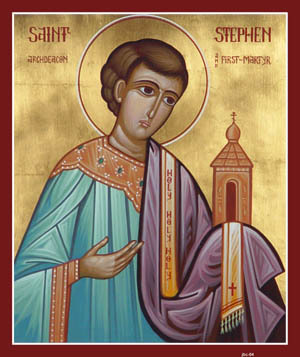 The deacon Stephen’s preaching — not his table service — gets him stoned to death. He is the next one to be “counted worthy to suffer for the name” (Acts 7:60). The violence against all of the believers is mounting. Saul begins to follow the church, persecuting the believers. As they are “every day in the temple and house to house,” so he is “ravaging the church by entering house after house, dragging off both men and women” (Acts 8:3). But “those who were scattered went from place to place, proclaiming the word” (Acts 8:4). Eventually even Saul is “counted worthy to suffer for the name,” and his conversion leads him to travel widely, entering house after house again, only this time to form churches. Worthy is the Lamb who was slain, Christ the Lamb. Worthy are you, when you suffer dishonor for the sake of the name. The church thrived and grew when the going got tough. Even today, “the blood of the martyrs is the seed of the church” (Tertullian). A blood-spattered poster of Jesus Christ is seen inside the the Coptic Christian Saints Church in the Mediterranean port city of Alexandria (CNS). Worthy are you, when you proclaim the good news of Christ not just at church, but also as you go about your daily life. This entry was posted in Daily Office and tagged A Song to the Lamb, Acts, deacon, Gamaliel, house church, Paul, persecution, Prayer for Mission, priesthood, proclamation, Saul, Stephen on August 9, 2016 by Rodger Patience. My ways are not your ways. Gosh! Today, we see in the lessons, canticles, and collects of Morning Prayer three examples of the upside down ways of God. It was only a question … gosh! In the OT reading we have the beginning of the story of David and Goliath, which we may remember from childhood as the victory of the small over the great. David with his slingshot (and his faith) triumphs over the strength and weapons of the giant Philistine. David, the youngest brother, is only supposed to be bringing food to his older brothers, but he hears around the camp that the king will reward whoever kills Goliath. But there’s also a subversive political strain to the story, since the shepherd boy David is being groomed by God to supplant the king of Israel. The anointing of God is being taken away from Saul and giving to David instead. We see that same subversive streak in the lesson from the Acts of the Apostles. The anointing of the Holy Spirit, which the disciples had assumed was an additional gift to the Chosen People — the Jews who believed in Jesus as Lord — is now falling on anyone who hears the good news. Even Gentiles are receiving God’s spirit. What next? What’s next for the disciples is the conviction that in Jesus, God was acting to save all people. The Gospel writers begin to compile their chronicles of Jesus’ life and teaching, four accounts that together draw out just how upside down his message was, for those with ears to hear. John, writing later than the others, even recounts Jesus saying “I have other sheep that do not belong to this fold. I must bring them in also, and they will listen to my voice. So there will be one flock, one shepherd” (John 10:16). The religious rules and the political order both turn upside down in the face of God’s grace and truth, seen most clearly in Jesus’ last gift of love. This entry was posted in Daily Office and tagged 1Samuel, Acts, Canticle 10, David, Gentiles, Goliath, John, Napoleon Dynamite, Philistines, Prayer for Mission, Saul on July 10, 2015 by Rodger Patience. Yesterday, several members of our deanery went to the Chazen Museum of Art on the campus of the University of Wisconsin to see an exhibit of The Saint John’s Bible. The Saint John’s Bible is the first handwritten and hand-illuminated Bible commissioned by a Benedictine abbey since the invention of the printing press. It represents 15 years of work by a team of calligraphers and artists under Donald Jackson in Wales and a Committee on Illumination and Text at St. John’s Abbey in Collegeville, Minnesota. The exhibit at the Chazen Museum includes actual pages from The Saint John’s Bible and a display of the calligraphers’ tools, including hand-cut quills and tools for applying gold leaf. There is a video documentary about the process of creating the Bible, and an example of a full-size “Heritage Edition” bound in oak boards and rich leather. One of the most arresting pages in The Saint John’s Bible is the frontispiece to the Gospel of John. I own the reproduction volume of the Gospels and Acts, so the featured image for this post is a closeup of that page. Donald Jackson uses gold leaf to signify God, and the figure of the Word made flesh shines brightly from the cosmic background (based on images from the Hubble telescope) behind him. The art underscores the way John connects the coming of Christ to the account of creation in Genesis. The keyhole along the left edge of the image reminds me of the sermon I heard in Munich on December 26, St. Stephen’s Day. 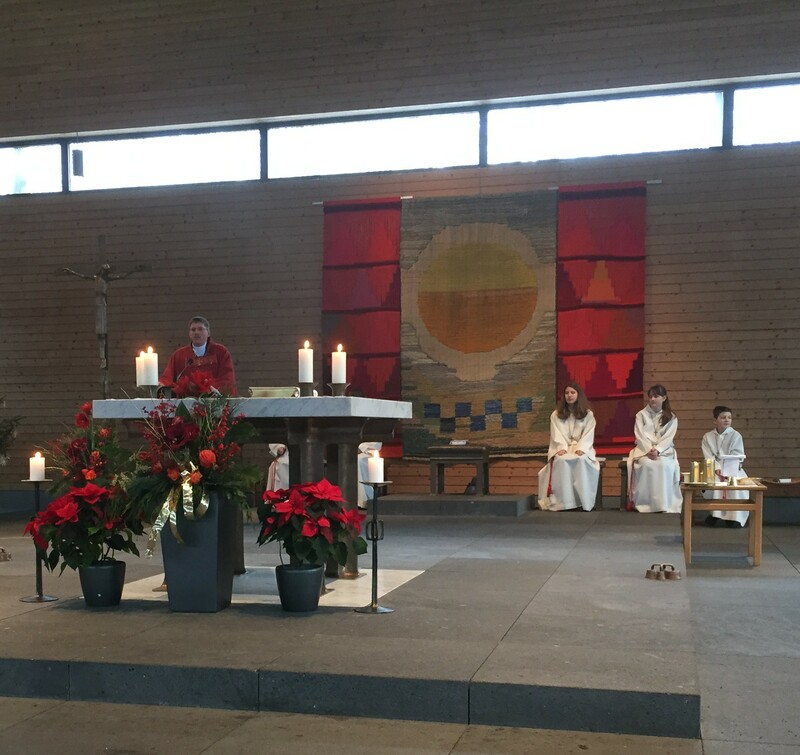 We attended the Eucharist with my wife’s Tante Barbara at her neighborhood church, Maria Trost. The priest spoke of this opening passage of John’s gospel, describing Jesus as not just the “word” of God, but as the “password” whose coming opens the heavens to human beings. Stephen, he went on to say, was one of the first who knew the password, who exclaimed as he was being stoned, “Look, I see the heavens opened and the Son of Man standing at the right hand of God!” (Acts 7:56). Readers should not be surprised if they find that their engagement with The Saint John’s Bible opens their imaginations, hearts, souls, and intellects to new ways of conceiving God. In addition, they may also find themselves entering a deeper relationship with God (xiv). The Saint John’s Bible is a beautiful, sacramental expression — in ink and gold leaf, vellum and leather, word and image — of the “immeasurable riches of [God’s] grace in kindness toward us in Christ Jesus,” as today’s Epistle reading suggests. May meditating on its words and images, and on the Word made flesh whom it reveals, open the heavens to you, too. This entry was posted in Daily Office and tagged Acts, Colossians, Ephesians, flesh, gold leaf, heavens, illumination, John, open, password, quill, Saint John's Bible, Stephen, vellum, word on January 14, 2015 by Rodger Patience. Them I know … but who are you? Would you be recognized as a follower of Jesus (not just by evil spirits, but by anybody you meet)? When you talk about your faith, are you talking about an abstraction or are you talking about someone you know? You don’t have to be perfect, that’s for sure — just look at David, featured in our Old Testament reading this morning in the act of committing adultery with Bathsheba and having her husband Uriah killed. However, you do have to be known by God, and you have to do what God’s followers do — repent. Knowing God and being known, just like any friendship, means putting in the time. That’s largely what we are doing when we pray the Daily Offices — spending face time with God. Coming face to face with the living God, especially as we meet him in Jesus, highlights our sinfulness and leads us to want to change. David will be confronted by Nathan, the prophet of God, in tomorrow morning’s reading, and he will repent of his sin. Saul, whose early ministry was to persecute Christians, repented after he began to know the risen Jesus. In a complete turnaround (which is basically what repenting means), his new ministry under the new name of Paul was to help establish new churches. Are you putting in the time and making the changes that your friendship requires? This entry was posted in Daily Office and tagged Acts, Bathsheba, David, friendship, Jesus, Morning Prayer, Nathan, Paul, repentance on August 8, 2013 by Rodger Patience.